Drawing upon personal experience, clinical knowledge, social research, and interviews, Wade Rowatt provides the layperson with the necessary tools to assess and provide spiritual help to adolescents in crisis. 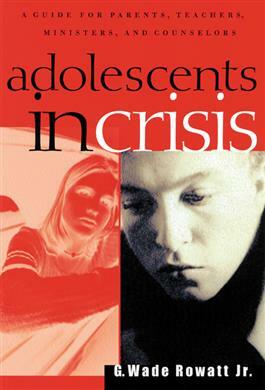 Rowatt discusses adolescent crises such as: family problems, sexual problems, substance abuse, depression, and suicide. He also takes an in-depth look at the school violence problem that has been at the forefront of the minds of parents, school administrators, and churches alike and provides them with a comprehensive plan for dealing with this issue in a spiritual manner. Ginny Ward Holderness, Forrest C. Palmer, Jr.